San Diego-based Ballast Point on Wednesday opened the first brewery in Downtown Disney as part of Disney’s ongoing renovation of the area. The 7,000-square-foot restaurant and bar has a nautical theme, a nod to Ballast Point’s origin, and offer a patio with a view of all of Downtown Disney. There are more than 50 styles of beer on tap, including the well-known grapefruit sculpins as well as some beers specifically brewed for the location. 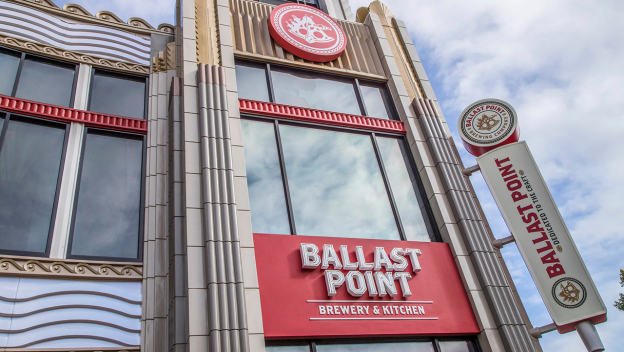 “Ballast Point is born and raised in Southern California, so we’re particularly excited to strengthen our relationship with the local Anaheim community and beyond this, the many guests who visit Disneyland each year,” Ballast Point president Ben Dollard said in a statement. The brewery, divided between an enclosed restaurant and a beer garden patio with cabana seating, occupy the space that used to house Build-A-Bear Workshop. Ballast Point occupies the upper floor while the lower floor is held by New York-based Black Tap Craft Burgers & Beer. The Disney location is the brewery’s ninth tasting room, including San Diego and Long Beach, Virginia and Chicago. Started in 1996 by a group of homebrewers, Ballast Point grew to be one of the 50 largest craft breweries in the country. In 2015, it was sold to New York’s Constellation Brands for $1 billion, setting a record price for a craft brewery. Ballast Point has been aggressively expanding since. Another tasting room in planned for San Francisco, its first Northern California location.